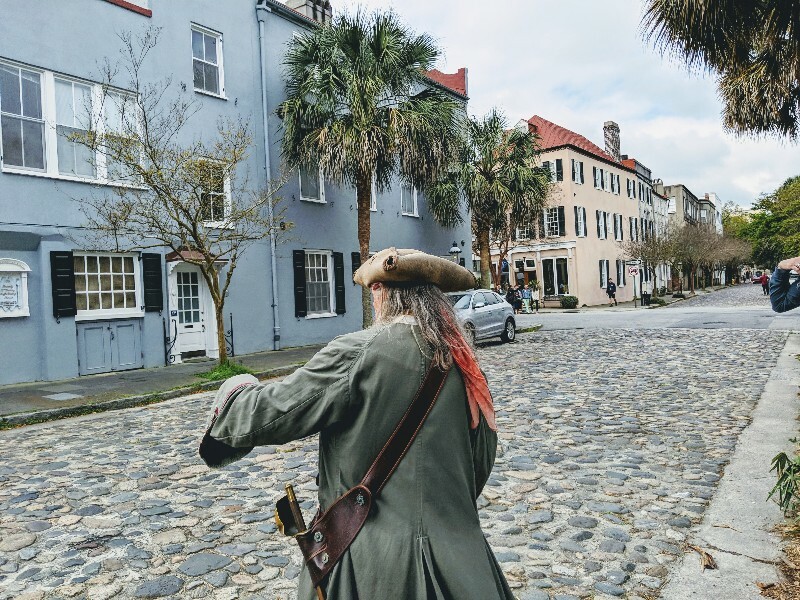 Charleston is known for its Southern charm, Civil War history, ghosts, and delicious food, but did you know pirates frequented Charleston? Until I started researching our visit I had no idea that pirates played such a significant role in Charleston history. 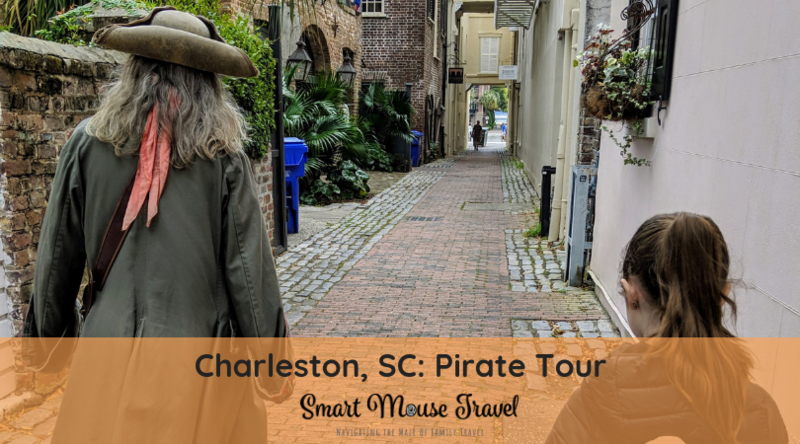 Intrigued by Charleston’s pirate past I discovered Charleston Pirate Tours and booked a walking tour for our visit. What Is Charleston Pirate Tours? Charleston Pirate Tours is a local company owned by Pirate Eric and his wife, Pirate Sabrina. They offer pirate, ghost, Civil War, Colonial, and children’s walking tours around the city of Charleston year round. When I presented the list of Charleston pirate tour choices to Elizabeth she carefully considered her options. After much deliberation she chose the ​Charleston Pirate Tour. This tour has garnered much attention from media outlets like the Today Show, Fox and Friends, USA Today, parents.com, and many more. We purchased our tickets for the Charleston Pirate Tour online at home before our trip. Once the purchase was complete I received a confirmation email with all the information I needed. On the day of the tour you meet your guide at the Powder Magazine Museum. Just look for a fully costumed pirate and, if the weather allows, a parrot. Once everyone is checked in, your adventure through the oldest parts of Charleston begins. I always take notes, but on the Charleston pirate tour I took a record number—ten pages’ worth to be exact—and that was considering all the time I simply listened or couldn’t write as fast as the stories were told. Eric is a fabulous mix of subject matter expert and a gifted entertainer. I won’t spoil all the fun, but here are a few highlights of the information covered during our tour. Did you know that pirate ships operated like a democracy? The crew voted on all decisions. The only time a captain’s order had to be obeyed without vote was during active engagement. The economy of Charleston was quite poor at the start of the colony. Pirates selling goods at a steep discount were useful to those living in the area. However, as Charleston began to grow crops and gain wealth the pirates were no longer welcome. There were several famous pirates that passed through Charleston, South Carolina. In particular Eric spent a lot of time telling stories about the lives of Gentleman Pirate Stede Bonnet, Calico Jack, and Blackbeard. We also learned about Anne Bonny and Mary Read who were female pirates during the same time period. I could have listened to Pirate Eric’s stories all day. Pirate Eric did a great job of getting some tough points across without causing kids to ask awkward questions later. For example, Blackbeard’s crew blockaded Charleston Harbor in 1718. They held ships and people hostage in exchange for medicine to treat STDs. When discussing Bleackbeard’s blockade of Charleston Harbor Eric used the term “negotiated affections” which lead to “uncomfortable infections.” All the adults immediately understood, but it went over the head of younger kids. What Do You See On The Charleston Pirate Tour? 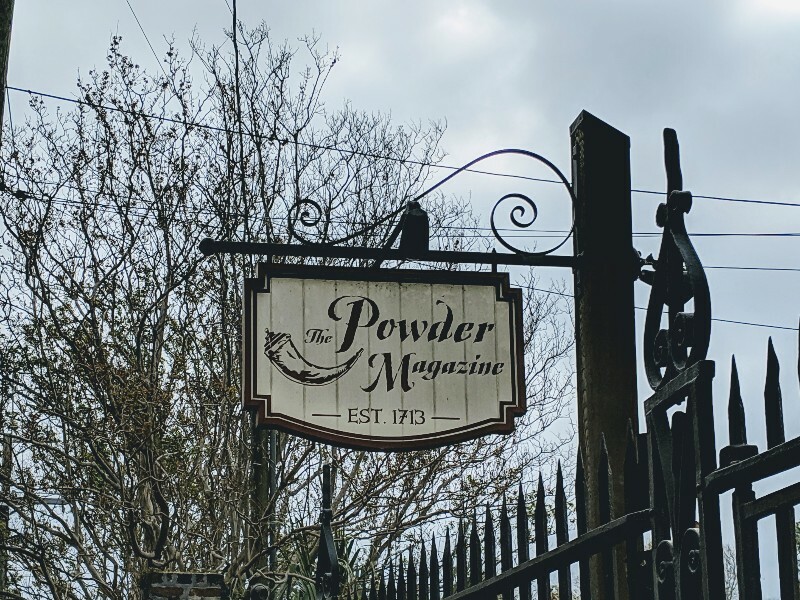 The Charleston pirate tour starts in the Powder Magazine Museum. This building is the oldest one in the Carolinas and once held 10,000 pounds of gunpowder. The design of the building nods to the original use. The walls are extremely thick, the ceiling is thin, and there is sand inside the attic. This way an accidental blast and subsequent fire would hopefully be well contained. From the Powder Magazine Museum we walked to St. Philip’s Church. 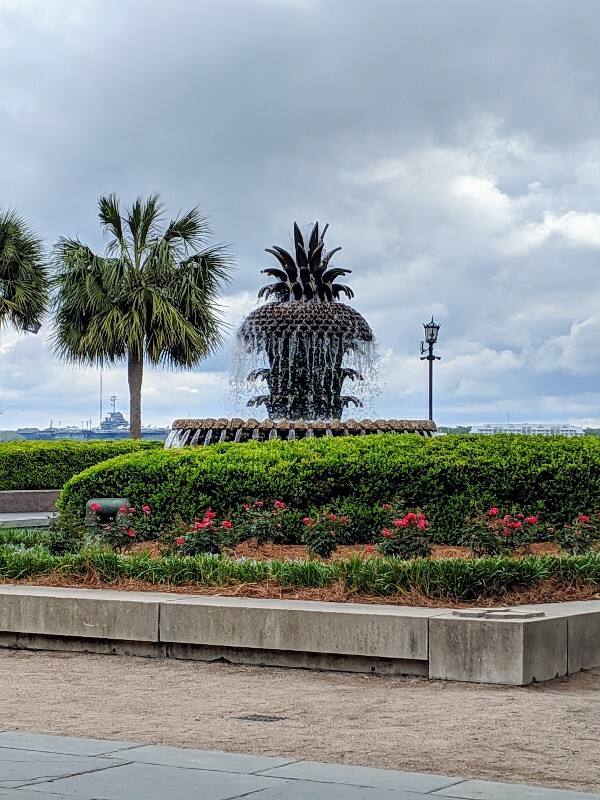 Then it was off to Waterfront Park through old streets past Dock Street Theater and the Pink House before arriving at the iconic Pineapple Fountain. We then walked along Waterfront Park before making our way past Rainbow Row. Not long after that it was time for our tour to end. Who Should Go On A Charleston Pirate Tour? The 2-hour walking Charleston pirate tour was a highlight of our Charleston visit. Our tour group ranged from a toddler in a stroller to older adults. Everyone seemed engaged in the tour except for the toddler. I think elementary aged and older kids would get the most out of this particular Charleston pirate tour. Charleston Pirate Tours also has a 1-hour Children’s Treasure Hunt for younger kids. This tour has pirate activities and a treasure hunt mixed in with learning about pirates to entertain kids under 8 years old. 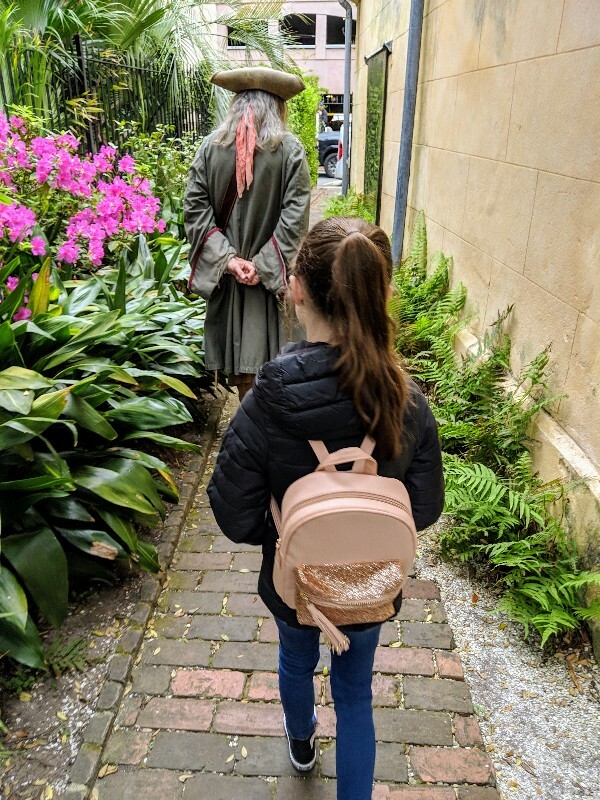 Friends of ours with kids age 8 to almost 13 years old opted for the Charleston Pirate Tours nighttime pirate and ghost tour. Everyone in the group was engaged and interested throughout the tour. Parents appreciated the history lesson and the kids liked the pirate stories. Leading up to our trip to Charleston I was extremely excited for our Charleston pirate tour. Fortunately, the tour was just as informative and entertaining as I had hoped. 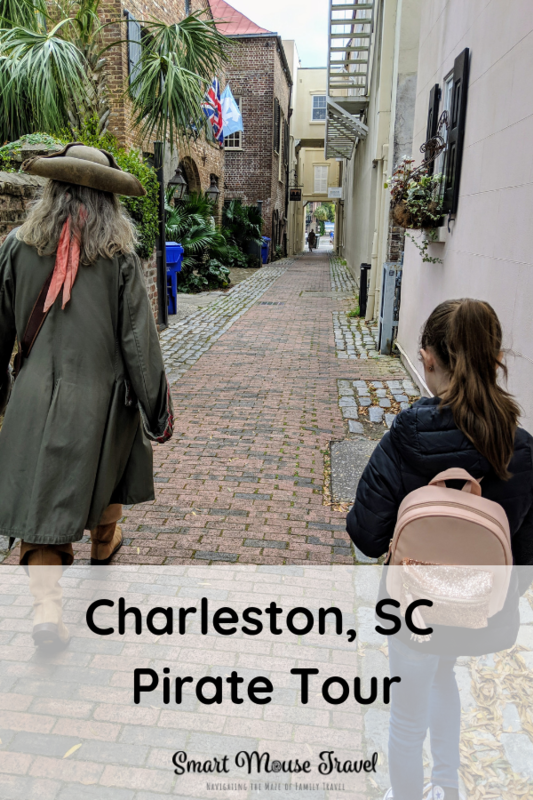 Our Charleston pirate tour experience is one of the most fun family activities we did in Charleston. We took our tour on the first full day we were in town, and it gave us a great overview of Charleston. We were able to easily find key landmarks on our own later because we had already walked around the area. 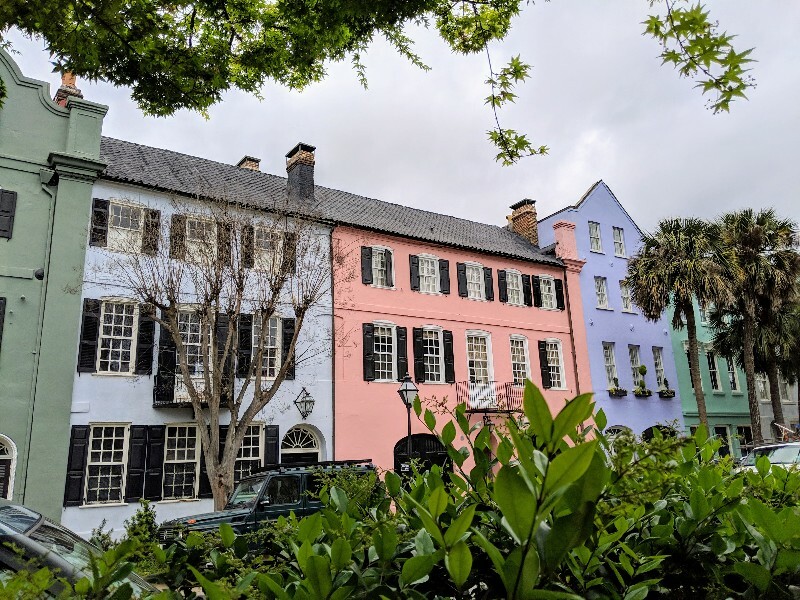 I highly recommend taking one of the many walking tour options Charleston Pirate Tours offers when you visit Charleston, South Carolina. Oh! This would be so much fun! I need to plan another trip to Charleston sometime soon!